Review: A story of singer-songwriter Amy Winehouse. From the same director that did the amazing film Senna (2010). Just like Senna I had no real interest in the subject matter or knew nothing about either story. Very well edited. One of the things I like it that there are no real interviews as such with the people. It is all constructed from sources such as telephone, voicemail calls etc. A very sad, heartbreaking film. Obviously we all know what happened but even still it gets to you. A very dramatic film. All the songs to me suddenly became more real and meaningful. I think because the lyrics come onto the screen and you can read them. There are clips of her with Tony Bennett and he came across as a friendly giant who gave her nothing but encouragement. I know that this film has been criticized by her dad. However, I felt that the film was not trying to portray him in a bad light. 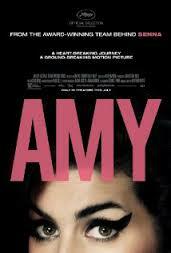 The film is about Amy rather than her father. Amy’s tragic story is told with great sensitivity. A great achievement in film-making. At the Bafta Awards in 2016 this won Best Documentary. At the Academy Awards also in 2016 this won one Oscar and that was for Best Documentary Feature.